DHAKA, Bangladesh — On the fourth floor of a nondescript pale-blue government building in Old Dhaka, clerks are stapling together copies of depositions from witnesses to the crimes committed during Bangladesh’s 1971 war of secession from Pakistan — a conflict that may have killed up to three million people, according to the Bangladeshi government. Above them on the wall is a map showing the 11 sectors of what was then called East Pakistan. 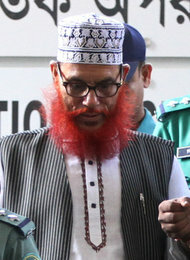 Strdel/Agence France-Presse — Getty ImagesDelwar Hossain Sayedee, a leading cleric of Bangladesh’s Islamist party, Jamaat-e-Islami, at the International Crimes Tribunal in Dhaka in November. In the office next door sits Abdul Hannan Khan, the chief investigator for the International Crimes Tribunal in Bangladesh, a court set up by the Bangladeshi government in March 2010 to “try and punish any individual or group of individuals, or any member of any armed, defence or auxiliary forces, irrespective of his nationality” who committed crimes against humanity, genocide, and war crimes, among other things, in 1971. Khan, a former police inspector general, is an affable man, in control and in no rush, who seems remarkably uninterested in politics. He says that his agency has finished investigating seven people. On Nov. 20th, the first of them, Delwar Hossain Sayedee, a leader of Jamaat-e-Islami, an Islamist party opposed to Bangladesh’s independence, was charged with a slew of crimes. He will soon be joined in the dock by nearly the entire Jamaat leadership, including its former chief, the 89-year old Ghulam Azam, and two prominent members of the opposition Bangladesh Nationalist Party (BNP). No trial has yet taken place, but it already seems clear that the International Crimes Tribunal is an international tribunal in name only. Its exclusive focus on the Bangladeshis who bloodied their hands assisting the main perpetrators — the Pakistani military — makes the court look like an government appendage eager to settle a domestic score. Trying and punishing members of the former Pakistani Army is too sensitive politically for the current Bangladeshi government to even contemplate: it could cause a complete breakdown in relations with Pakistan. It would also be impractical, because there is no extradition treaty between Bangladesh and Pakistan. More arrests are sure to follow. Khan is investigating 10 other suspected collaborators, including another six members of the Jamaat and two of the BNP. There is also Ashrafuzzaman Khan, an American, and Moinuddin Chowdhury, a British citizen, both alleged leaders of the pro-army paramilitary body called Al Badr, which massacred Bengali intellectuals in December 1971. Khan says that Khan lives in New York and Chowdhury in “UK, London.” Their being far away might seem like a serious obstacle, but according to one political analyst (who wishes not to be identified), even those cases will be a “slam dunk” because the two men will probably be tried — and convicted — in absentia. The tribunal is shaping up to be a travesty of justice. The government seems to be using the court simply to rubberstamp a predetermination that the accused are guilty. For most Bangladeshis, that truth has been established since 1995, when a self-appointed panel of eminent citizens, headed by the current justice minister, compiled “evidence” of war crimes against 16 individuals, including the seven men currently awaiting trial before the International Crimes Tribunal. The Jamaat members’ defense team has asked one of the judges to step down because he sat on the 1995 panel. If, as is nonetheless expected, nearly the entire leadership of the Jamaat is convicted and hanged within two years, the Bangladeshi opposition will be conveniently weakened in time for the next parliamentary election in 2013. Such a nakedly partisan exercise of justice would make it much harder for an accurate history of Bangladesh’s birth to ever be written. According to M. A. Hasan, of the War Crimes Fact Finding Committee, an independent body investigating the 1971 massacres, 95 percent of the atrocities were committed by Pakistani soldiers who resisted secession — and were under orders to kill to prevent it — on the theory that the Islamic unity of the two wings of Pakistan must not be compromised. Yet none of them will be in court. Nor will any member of the pro-independence militias be charged for massacring tens of thousands of Bihari migrants who sympathized with Pakistan. The current list of accused looks so conveniently expedient for the Awami League of Prime Minister Sheikh Hasina that for the sake of appearance alone Hasina might have better served herself, and Bangladesh, by making a greater show of endorsing an independent war crimes trial subject to international standards. The defense teams do count some high-caliber international lawyers, but the government has effectively barred them from being present in court by making it hard for them to even get into the country. In the midst of all the politicking, Hasan has somehow managed to adopt an impartial position. A few years back, he submitted to the government a list of 1,775 suspected war criminals, including the accused currently on trial but also collaborators from the Awami League’s coalition partners and members of the former Pakistani military. At the end of a visit to his office last Tuesday, during which he bemoaned continued impunity, Hasan produced what he called a “genocide map” of Dhaka. It showed 48 mass graves, with latitudes and longitudes.